Every teacher remembers his or her first "tough kid" experience. Maybe the student ignored your directions or laughed at your attempts to utilize the classroom discipline steps. We all have at least one story to share, and for some teachers, teaching a tough kid is a daily challenge. It seems that no matter what teaching techniques you try to pull out of your educator hat, nothing changes their behavior. I've had the privilege of teaching some tough kids. I say "privilege" for a reason. Teaching these students pushed me to be a better educator and a more compassionate person. I've detailed below five methods that have reduced misbehavior in my classroom and, better still, helped transform these students into leaders among their peers. I firmly believe that a student's misbehavior in the past does not necessarily equate to future indiscretions. At the beginning of the school year, I would walk down to the sixth grade teachers with my new class lists and ask questions. I would inquire about who works well together, who probably should not sit next to each other, and who caused them the most grief. Not surprisingly, teachers would share the names of the same students that were their "tough kids." If I had the privilege of having any of these students in my class, I looked forward to it instead of dreading it. Usually during the first week of school, I would try to have individual conferences with these tough kids. I'd take this as an opportunity to clear the air and wipe the slate clean. Often, these students can feel disrespected because their teachers already have preconceived ideas about how they are the troublemakers. Explain that you respect them and have high expectations for them this year. Lay the foundation for the student's understanding that you believe in him or her, because you might be the only one who genuinely does. Unfortunately, it has been my experience that some of the toughest kids to teach come from very difficult home situations. Inconsistent housing, absentee parent(s), lack of resources, and violence are only a few examples of what some of these students have to face every day. Kids that are neglected at home can act out in school to receive attention, good or bad. They want someone to notice them and take an interest in their lives. Don’t forget how important you are in helping your students develop not just academically, but also socially. Make an effort to show you care about them, not just their grades. Be proactive instead of reactive. The key to being a good mentor is to be positive, available, and trustworthy. One year with a great mentor can have a lasting, positive impact on a tough kid's life. Part of being a great mentor is your ability to make connections with these tough kids. Since these students sometimes don't have anyone encouraging them or taking an interest in their lives, have a real conversation about their future or dreams. If they have nothing to share, start talking about their interests -- sports, music, movies, food, clothing, friends, siblings, etc. Find a way to connect so that they can relate to you. Start off small and show a genuine interest in what they have to say. Once you've made a positive connection and the student can trust you, you'd be surprised how fast they might open up to talking about their hopes, fears, home life, etc. This is when you need to exercise professional discretion and be prepared for what the student might bring up. Explain that you do not want to violate his or her trust but that, as an educator, you are required by law to report certain things. Teachers need to have thick skin. Students may say things in an attempt to bruise your ego or question your teaching abilities. Remember, we are working with young children and developing adults. I'm sure you said some hurtful things that you didn't mean when you were growing up. Students can say things out of frustration or boredom, or that are triggered by problems spilling over from outside of your classroom. 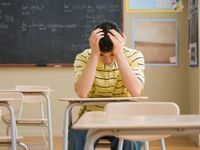 Try to deal with their misbehavior in the classroom -- they might not take you seriously if you just send them to the office every time they act out. These are the moments when they need a positive mentor the most. Once trust has been established, remind these students that you believe in them even if they make a mistake. I've vouched for kids during grade team meetings only to have them get into a fight at lunch the same day. They make mistakes, just like we all do. It's how we respond to their slip-ups that will determine if they'll continue to trust us. Explain that you're disappointed in their actions and that you know they can do better. Don't write them off. Tough kids are used to being dismissed as hopeless. Instead, show them that you care and are willing to work with them. Helping a tough kid overcome personal issues isn't something that happens overnight, but it is a worthwhile investment in his or her future. 5. Expect Anything and Everything! All of our students come from a variety of cultures, nationalities, and home environments, and these five techniques that have worked for me might barely scratch the surface of how you interact with the tough kids in your classroom. If you have another method that has helped you reach out and connect to a tough kid, please share it below in the comments section.